Frederick was born in Newbury in 1885, the son of Charles Hammond and his wife Mary Ann née Clark. Mary was Charles’ second wife whom he married in 1866; his first wife, Ann, had died the previous year leaving him with two young sons, William (born 1860) and George (1863), to raise. In 1867 the first children of his second marriage, twins Charles and Edward, were born. Their first daughter Harriet was born in 1871 and more children followed: Ada Louise (1876), Charlotte (1878), Edwin John (1880), Frederick (1885) and Albert James (1887). In 1889 Charles died aged 53 leaving Mary to raise the younger children with the help of their elder siblings. At the time of the 1891 census she was living in Speen View Terrace, Russell Road; one of the elder children, Charles, was still living at home no doubt contributing to the family budget from his wages as a smith's lanourer; nevertheless, with four young children to support, Mary had to work as a laundress. Ten years later the family unit had shrunk, 16 year-old Frederick was the only child still living with his mother in Kennet Road though he was by this date working as an ironmonger's porter. Moving forward another ten years to the 1911 census Frederick is still in Newbury and was the head of a household comprising himself, his sister Harriet, who was married with three children, and only one of those children - Gertrude, aged 12. Frederick was still working as a porter, but no longer for an ironmonger instead he was employed by a piano dealer - Mr Cary whose premises on the corner of Northbrook Street and Park Street were among the grandest in town. When war was declared on 4 August 1914 it appears that Frederick was already a soldier, but only just and only as a territorial. He served with the Monmouthshire Regiment, which was entirely a territorial unit with no regular battalions. His service number, 1943, can be compared with other numbers issued in 1913 and early 1914 (1934 was issued in May 1913 and 1983 in July 1914) to suggest he enlisted in 1913, sometime not too long after 5 May. According to his entry in Soldiers who died in the Great War he enlisted in Plaistow, London; a confusing place to enlist in a Welsh territorial unit in peacetime? Judging enlistment dates from service numbers can never be better than indicative and Soldiers who died in the Great War is far from error-free – but with no better information to go on, Frederick’s enlistment will remain something of a mystery. What happened between 1911 and 1913 to change Frederick's life so dramatically? After spending over 25 years in Newbury he enlists in London into a Welsh territorial regiment. There is another mystery arising from his entry in the Register of Soldier's Effects - which records his sole legatee as Mrs Annie Garrett - who was she? Perhaps she was the reason for his move from Newbury? Frederick's entry in the Register of Soldiers' Effects, which shows Mrs Annie Barrett as his sole legatee - who was Annie? Whatever the reason, it was with the 1st Battalion of the Monmouthshire Regiment that he landed in France on 13 February 1915. Originally reluctant to commit the territorial battalions to battle the War Office was forced to reconsider after the regular army’s horrific losses in 1914, notably in the 1st Battle of Ypres in October/November. A few Territorial battalions were sent out in late 1914 and performed well, so, in the early months of 1915 many of the 1st line territorial battalions (made up of men who volunteered for overseas service) were sent to the Western Front to relieve the strain on the Regular and Indian Army units holding the newly-formed line through western Belgium and northern France. Canadian units also began to arrive at the front in this period. The first great test of many of these fresh units was the German offensive launched on 22 April 1915 with the aim of capturing Ypres. This offensive, known as the 2nd Battle of Ypres, is notable for the first use of poison gas on the Western Front. The Germans released 168 tons of chlorine on a four mile front, largely held by French troops; around half of the 10,000 troops affected were dead within ten minutes of the gas reaching their lines. The Germans had not anticipated that the gas would be so effective and were slow in exploiting the gap created in the Allied lines; a counter-attack by the British II Corps was able to prevent disaster. The Germans continued the offensive and the 1st Monmouthshire Battalion was heavily involved in the line near Zonnebeke; however the battalion war diary has been lost so there is no detailed record of the events of the 24 April when Frederick was killed in action. The battalion was with its Brigade and Division manning the line near Zonnebeke east of Ypres. To their north the Germans launched a second gas attack against the Canadian Division and the 28th Division was assaulted more conventionally, resulting at some point in Frederick’s death. The news has been received of the death of Lance-Corporal F Hammond, of West Fields, who was serving in the Monmouth Regiment. He had been in the firing line since early in the year. His regiment had been engaged in severe fighting, and he was killed on April 26th [sic]. He was buried, with other fallen comrades, behind the trenches. In a letter from a member of the regiment, he was spoken of as “a good soldier and the best of pals.” Hammond, before going into the Army, was employed as a porter for Mr Cary, Northbrook-street, Newbury. Although the newspaper reports his burial ‘behind the trenches’ his remains were not identified during the post war clean up of the battlefields. While he may lie in one of the thousands of graves marked A Soldier of the Great War - Known unto God his name is remembered on panel 50 of the Menin Gate memorial to the missing in Ieper (Ypres), Belgium. 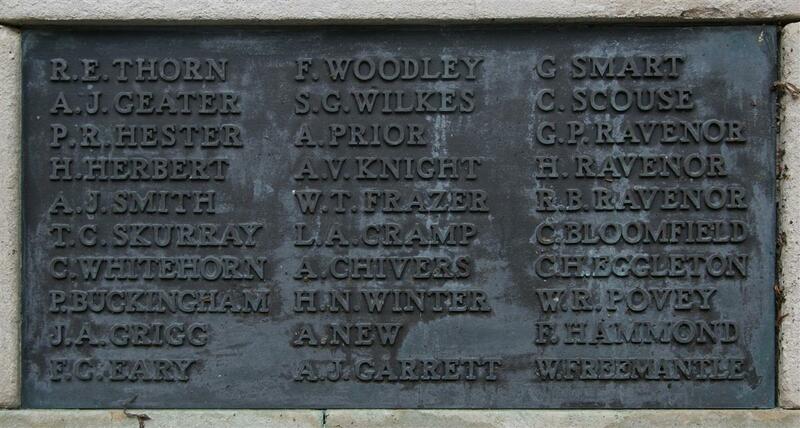 Locally Frederick is remembered on tablet 12 of the Newbury Town War Memorial.